Blue Dawn™ has delicious large dark blue fruit. Rabbiteye variety. Produced and marketed by Tharfield Nursery Ltd in association with Plant & Food Research. PVR Protection 'Takahe'. Habit - Attractive all year round; Spring - ‘Lily of the Valley’ like pink tinged white flowers, Summer - delicious fruit, Autumn/Winter - amazing display of burgundy wine autumn tones. Pollination - Mostly by bumble bees or honey bees, some species are self-fertile, cross pollination will improve fruit size and yield. Cross pollination with Blue Magic or Tasty Blue. Harvest - December to February. To ensure the best flavour leave fruit on bush for 7-10 days after turning blue. Blue Magic™ has copious amounts of delicious medium sized fruit. Thinning of the fruit will encourage larger berries. Rabbiteye variety. Produced and marketed by Tharfield Nursery Ltd in association with Plant & Food Research. PVR Protection 'Whitu'. Habit - Attractive all year round; Spring - ‘Lily of the Valley’ like pink tinged white flowers, Summer - delicious fruit, Autumn/Winter - bronze toning's. Pollination - Mostly by bumble bees or honey bees, some species are self-fertile, cross pollination will improve fruit size and yield. Cross pollination with Blue Dawn or Tasty Blue. An excellent cropper producing large clusters of medium sized fruit. Fruit have firm flesh. Rabbiteye variety. Habit - Rabbiteye blueberry. Ideal for warm climates as they require low chill hours for bud initiation. Fruits on second year wood. Size - 2m x 1.5m. Pollination - Cross pollination with another Rabbiteye variety will improve yield. Harvest - Harvest from mid February to early April. To ensure the best flavour leave fruit on bush for 7-10 days after turning blue. Delicious medium blue fruit with firm flesh and a mild flavour which stores well. Northern Highbush variety. Habit - Northern highbush. Ideal for cooler climates, Waikato south. Slow growing hardy upright bushy plant. Fruits on second year wood. Pollination - Cross pollination with another Northern Highbush variety will improve yield. Harvest - Mid January to mid February. 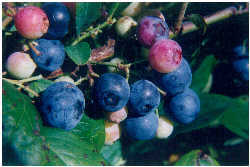 To ensure the best flavour leave fruit on bush for 7-10 days after turning blue. Fruit are small to medium in size, very firm and round in shape. Excellent flavour. Bred by Plant & Food Research New Zealand. Southern Highbush variety. Habit - Southern Highbush variety, suitable for northern districts from Waikato. Ideal for warm climates as they require low chill hours for bud initiation. Fruits on second year wood. 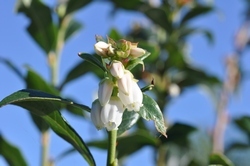 Pollination - Cross pollination with another Southern Highbush variety will improve yield. Harvest - Harvest from October to late November. To ensure the best flavour leave fruit on bush for 7-10 days after turning blue. Heavy producer of delicious medium blue fruit. Firm fruit with a mild flavour. Northern Highbush variety. Habit - Northern highbush. Ideal for cooler climates, Waikato south. Tall and upright bushy plants. Fruits on second year wood. Harvest - Mid December to late January. To ensure the best flavour leave fruit on bush for 7-10 days after turning blue. Excellent crop of large dark blue fruit. Berries must mature well before picking/harvesting. Rabbiteye variety, ideal for Waikato north. Habit - Upright growth habit with blue/green foliage. Attractive all year round; Spring - ‘Lily of the Valley’ like pink tinged white flowers, Summer - delicious fruit, Autumn/Winter - amazing display of burgundy wine autumn tones. Size - 2 x 1.5m. Pollination - Mostly by bumble bees or honey bees, some species are self-fertile, cross pollination will improve fruit size and yield. Cross pollination with Blue Magic, Blue Dawn, Powder Blue, Rahi or Tasty Blue. Harvest - March. 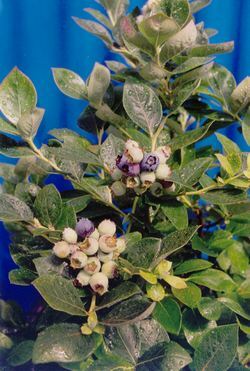 To ensure the best flavour leave fruit on bush for 7-10 days after turning blue. Muffin™ has heavy crops of medium sized fruit. 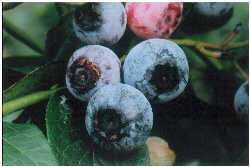 This is a Highbush Blueberry requiring a higher chill requirement than the Rabbiteye varieties. Acid soil required. Produced and marketed by Tharfield Nursery Ltd in association with Plant & Food Research. Provisional PVR Protection 'Hortblue Petite'. Habit - This is a highly attractive deciduous compact bush all year round Spring - 'Lily of the Valley' like flowers, Summer/Autumn - delicious fruit, Autumn/Winter - bronze toning's. Pollination - Mostly by bumble bees or honey bees, some species are self-fertile, cross pollination with another Northern Highbush variety will improve fruit size and yield. Harvest - Crops in December and again in March / April. 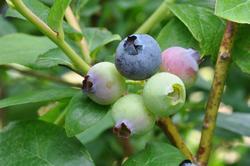 To ensure the best flavour leave fruit on bush for 7-10 days after turning blue. Delicious sweet dark blue fruit. High yield. Southern Highbush variety. Habit - Erect bush that is slightly spreading. Southern Highbush, suitable for northern districts from Waikato. Ideal for warm climates as they require low chill hours for bud initiation. Fruits on second year wood. Harvest - Harvest from late November to early January. To ensure the best flavour leave fruit on bush for 7-10 days after turning blue. Excellent crop of large clusters of light blue fruit. Fruit may need thinning to produce larger berries. Fruit store well. Rabbiteye variety. Habit - Rabbiteye blueberry. Suitable for all districts. Fruits on second year wood. Harvest - Harvest from late January to mid March. 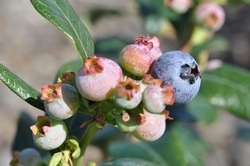 To ensure the best flavour leave fruit on bush for 7-10 days after turning blue. Moderate crop of firm very light blue fruit. Fruit quality is outstanding. Rabbiteye variety, ideal for Waikato north. Berries are prone to splitting after heavy rain. Habit - Vigorous upright growth habit with blue/green foliage. Attractive all year round; Spring - ‘Lily of the Valley’ like pink tinged white flowers, Summer - delicious fruit, Autumn/Winter - amazing display of burgundy wine autumn tones. Pollination - Mostly by bumble bees or honey bees, some species are self-fertile, cross pollination will improve fruit size and yield. Cross pollination with Blue Magic, Blue Dawn, Powder Blue, Marui or Tasty Blue. Harvest - February. To ensure the best flavour leave fruit on bush for 7-10 days after turning blue. 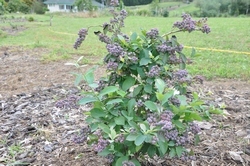 Northern highbush variety suitable for Waikato south. 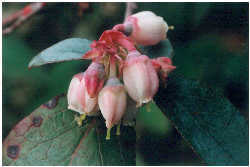 Very ornamental fruiting bush with pink/white flowers in early spring followed by dark blue firm fruit in late November to December. Fruit is of a medium size. Tends to overcrop so thinning is recommended in spring. Harvest - Ripening late spring to early summer. Harvest when the fruit turns blue. Try to leave for 5 to 7 days on the plant to enhance the flavour. High yields from this plant once it is established. 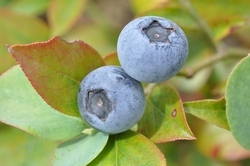 Sapphire Blue™ has delicious large blue fruit on lang arching canes. Rabbiteye variety. Produced and marketed by Tharfield Nursery Ltd in association with Plant & Food Research. PVR Protection 'PFRblue129'. Habit - Attractive all year round; Spring - ‘Lily of the Valley’ like pink tinged white flowers, Summer - delicious fruit, Autumn/Winter - amazing display of burgundy wine autumn tones. 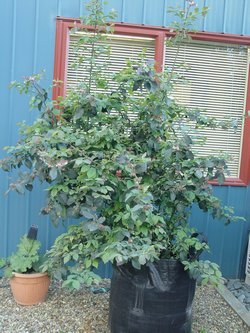 Small compact semi upright leafy plant with long arching canes. Pollination - Mostly by bumble bees or honey bees, cross pollination will improve fruit size and yield. Cross pollination with Blue Magic, Burst, Powder Blue, Sapphire Blue or Tasty Blue. Harvest - January to February. To ensure the best flavour leave fruit on bush for 7-10 days after turning blue. 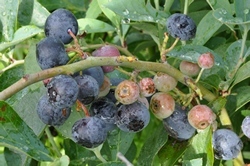 Summer Blue has delicious medium dark blue fruit with a red back. Southern Highbush variety. 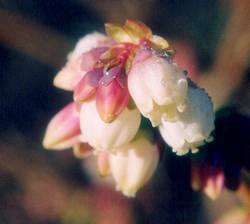 Habit - Southern Highbush blueberry. Ideal for warm climates as they require low chill hours for bud initiation. Early flowering means there is a risk of crop loss due to frost damage. Fruits on second year wood. Pollination - Cross pollination with another Southern Highbush variety improves yield. Harvest - Ripening from early December and again in March. To ensure the best flavour leave fruit on bush for 7-10 days after turning blue. Tasty Blue™ has rounded deep blue juicy berries. Rabbiteye variety. Produced and marketed by Tharfield Nursery Ltd in association with Plant & Food Research. PVR Protection 'Ono'. Habit - Attractive all year round; Spring - ‘Lily of the Valley’ like pink tinged white flowers, Summer - delicious fruit, Autumn/Winter - bronze toning's. Fruits on second year wood. Pollination - Mostly by bumble bees or honey bees, some species are self-fertile, cross pollination will improve fruit size and yield. Cross pollinate with Blue Magic or Blue Dawn. High yields of small to medium sized light blue berries. Needs plenty of water to develop the fruit. Habit - One of the original Rabbiteye releases. A vigorous upright bush. Glossy green foliage turning into beautiful burgundy autumn colours. Harvest - December to January. 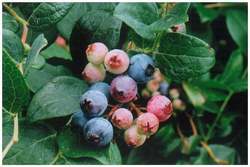 To ensure the best flavour leave fruit on bush for 7-10 days after turning blue.